Besides a wide range of delicious dining options at Nirwana Gardens Bintan Resort, there are also plenty of activities to keep us occupied at the resort. Located just a short 5-minute walk away from Nirwana Resort Hotel (also reachable via the Nirwana Gardens shuttle bus), the Nirwana Resort Centre offers a range of activities for guests of Nirwana Gardens. With facilities such as Flying Fox (S$10 per ride), Paintball (S$50 per person – 50 pellets; minimum 4 persons to participate) and Skirmish Laser (S$33 per game per hour; minimum 2 persons to participate), it is not surprising that Nirwana Gardens Bintan Resort is one of the most favored team-building place for companies based in Singapore. There are also activities at Nirwana Resort Centre for individuals e.g. Archery ($8 per person per session – with 25 arrows) where you get to challenge yourself with target boards at different distances. Instructors will be around to guide you on how to use the bow, aim and shoot. Remember to put on a wrist guard (also provided) in case of backlash from the bow string. 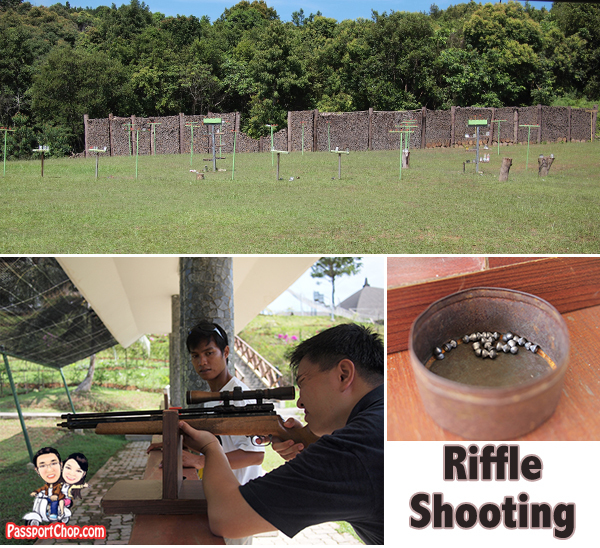 Air Rifle shooting is also available at Nirwana Resort Centre (S$8 per person per session – with 25 pellets). The aim rifle is quite heavy but luckily there are rifle stands to support it while you aim. Loading of the pellets is a simple procedure but leave it to the Nirwana Resort Centre staff if you are unsure. Just one tip if you want to be a marksman at this shooting range, when there is any shadow or black areas in sight when you are using the scope, there is a high chance that you will miss what you aim – just ensure that your scope sight is clear. 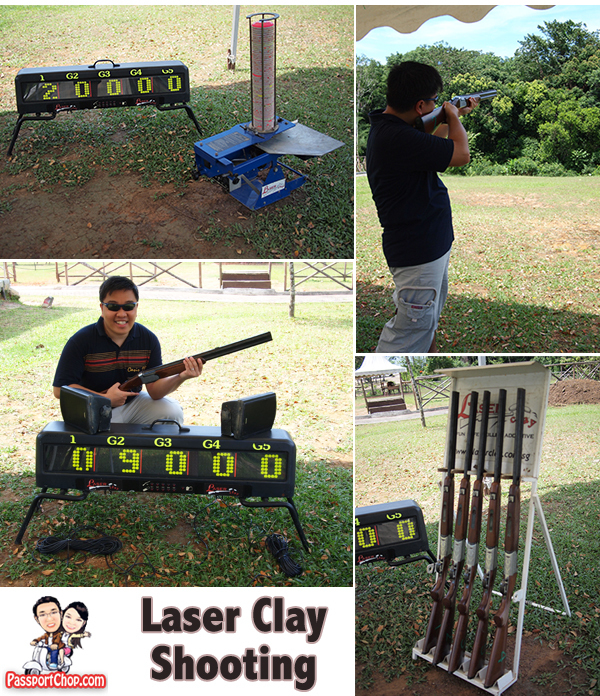 Laser Clay Shooting (S$10 for 12 clays of 24 shots) at the Nirwana Resort Centre is a safe, quick and efficient alternative to actual clay shooting. Using laser aiming, the system detects if you have hit the target without the need for actual shotgun ammunition and broken clay pieces. If you hit the target, there will also be a clear sound of broken clay emitted from the system. If you are tired and sunburnt from all the outdoor activities at Nirwana Resort Centre (by the way, the above activities – archery, air rifle shooting and laser clay shooting are all under shelter), you can enjoy a game of Bowling (S$4 per game; Friday & Saturday; Shoe rental at $1.50 per pair) at Hokki Bear Bowl. Bring your own socks or you can buy a pair for S$1.50 from the bowling centre. 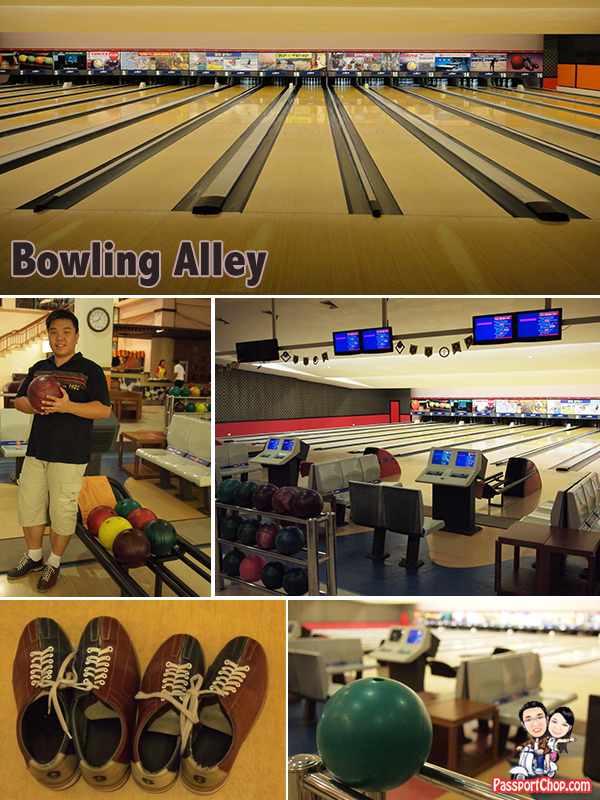 The Hokki Bear Bowl operates from 10am to 11pm so you can enjoy a game or two of bowling after shopping at Pasar Oleh Oleh and spa massage at Aroma Day Spa and seafood dinner at the Kelong. 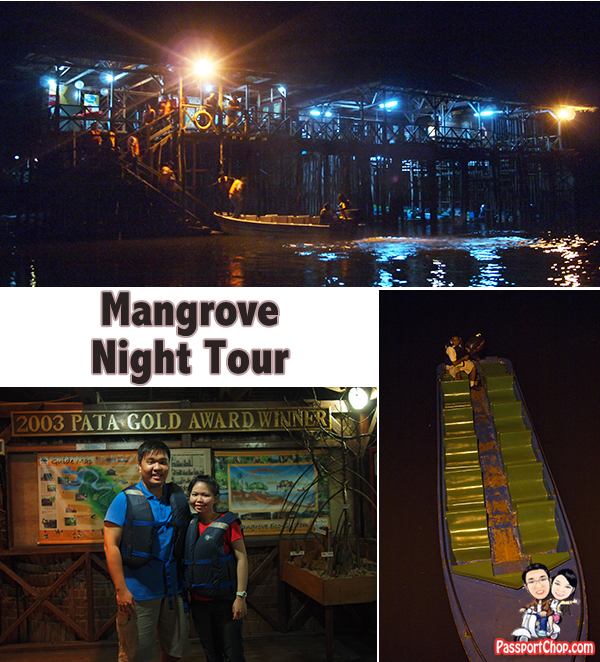 BRC Tours offers a Day/Night mangrove tour at Teluk Sebung. During the day tour (which starts very early in the morning), you can discover the diverse ecological wildlife that exists beneath the awe inspiring serenity of Bintan’s mangrove forest. Keep a look up for the exclusive Purple Heron and the signature yellow-and-black banded mangrove snake. During the night tour, be prepared to be mesmerised by the fireflies which gather around the trees by the mangrove swamps. These trees seemed to be lit up like a Christmas tree. Sometimes the boat will stop by one of these trees where you can have an up close and personal encounter with the fireflies as they fly around you and the boat. To book, email preferred tour time to [email protected] or call +62 (770)692092/29 (at least 48hrs i.e. 2 working days in advance) and quote ‘PassportChop’ in email booking. The Expedia website offers many special travel packages for a great deal. Explore a whole new world in Bintan Resorts with the lastest fun thrilling activity – All Terrain Vehicles (ATV) at Nirwana Gardens Bintan Resort. 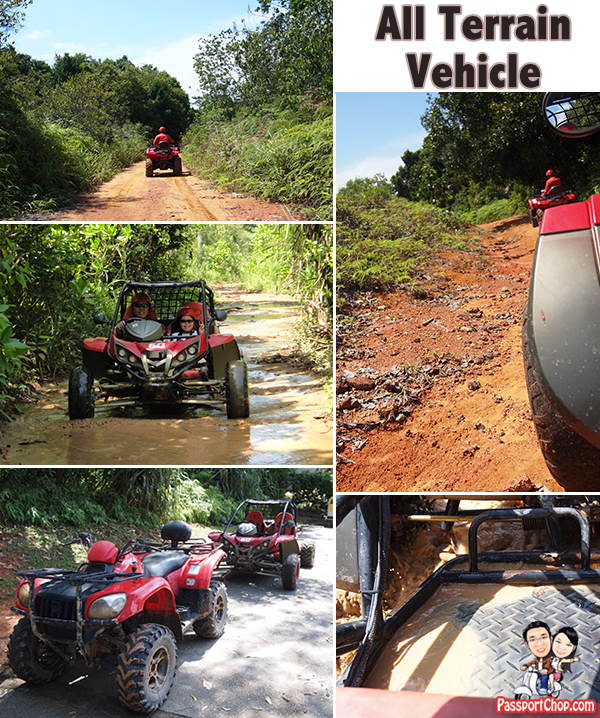 Get on an ATV and drive yourselves through the rough and rugged jungle trail terrain! You can choose from the Quad Bike (double seater) at $80 for 30 minutes or $120 for 1 hour or the Dune Buggy (double seater) at $120 for 30 minutes or $150 for 1 hour. Outdoor Adventures, our guide for our ATV tour around Bintan’s jungle conducted a quick safety briefing and provided a walkthrough of the functions of our dune buggy and within 5 minutes, we are good to go. The Dune Buggy functions just like any Class 3 vehicle except that the bottom part of the vehicle exposes you to quite a fair bit of the elements i.e. mud and water so be prepared to get wet and dirty especially along muddy trails. The steering of the Dune Buggy can get quite challenging especially along slopes so you need a fair bit of strength to turn around tight corners. Some mud puddles are so big that the entire dune buggy might need to be partially submerged (just the bottom part of the vehicle and wheels) so drive slow to avoid splashing of mud and water all over yourselves. Being a guest of Nirwana Gardens, you need not approach multiple operators to arrange to do all the above activities during your weekend getaway. 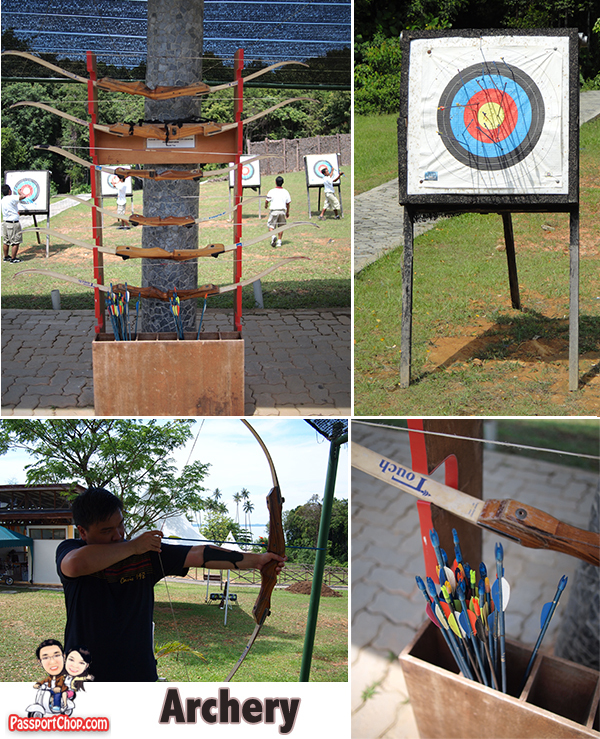 Simply inform your friendly Nirwana Gardens Bintan Resort staff and they will arrange for these activities for you! For updates on Nirwana Gardens and Bintan promotions and events, like Nirwana Gardens Resort Bintan Island Indonesia Facebook page and I Love Bintan Facebook page for more info. To book, guests are to quote “Passportchop” upon reservation. Reservations to be done via email at [email protected] or by telephone: +65 6323 6636. You can also book at their website at http://www.nirwanagardens.com. At the booking engine box, just key in “PASSPORTCHOP” (caps sensitive) in the Access Code box, after filling out the details of your travel period, and click on the Check Availability button – a popup window will open with the discounted rates and availability. Hope you enjoy your tour…You looks good in your photo…Thanks for sharing this to us..
Wow! This is truly an adventure for you. I love riding in an ATV. Going up and down the hill. Awesome! i know you too enjoyed your trip. This is awesome! You really have fun in there! Looking forward to your other blogs! Just wish to say your article is as amazing. The clearness in your post is simply cool and i can assume you are an expert on this subject. Well with your permission let me to grab your feed to keep updated with forthcoming post. Thanks a million and please keep up the enjoyable work. Usually I do not read article on blogs, however I wish to say that this write-up very compelled me to check out and do so! Your writing taste has been amazed me. Thanks, very nice post. Woah! I’m really loving the template/theme of this website. It’s simple, yet effective. A lot of times it’s difficult to get that “perfect balance” between user friendliness and visual appeal. I must say you have done a fantastic job with this. Additionally, the blog loads very quick for me on Firefox. Superb Blog! I just want to tell you that I’m beginner to blogging and definitely savored you’re blog site. Very likely I’m likely to bookmark your site . You surely come with very good articles and reviews. Thank you for revealing your blog. I just want to say I am just all new to blogging and site-building and definitely loved this page. More than likely I’m want to bookmark your blog . You absolutely come with remarkable posts. Thanks for revealing your webpage. We got a flyer at the ferry terminal where the Firefly or mangrove tour + seafood meal was going at $45 Adult / $35 Child – Google for Indobintan for contact. Hi Roger, that sounds like a great deal! I just checked the IndoBintan site – seems like they dont have the package mentioned; the mangrove tour was quoted as 38 SGD for adult. Perhaps the flyer is targeted at travellers already at Bintan. The clearness in your publish is simply spectacular and i could think you’re an expert on this subject. to keep up to date with imminent post. Thank you a million and please continue the gratifying work.